Born in 1795, Alachua pioneer James Tilatha Thomas is the second oldest person buried at Evergreen Cemetery and is also the cemetery’s founder. Thomas, from South Carolina, came to Florida after nine years in the Far East as a soldier-of-fortune. After returning to the States, Thomas settled in Florida in the 1830’s serving with the army during the Second Seminole War. He acquired considerable property holdings in Alachua County from famous Jewish Utopian, Moses Elias Levy. Thomas, a planter in his own right also superintended the Zetrouer Plantation south of Newnan’s Lake. In 1856 when his baby girl Elizabeth died, Thomas set aside a few acres of land that became Evergreen Cemetery. 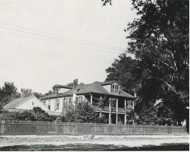 Thomas built a house in Gainesville on the spot where the new Alachua County Criminal Courthouse sits today. For many years the house was the Tebeau School for girls, which was founded by James Thomas’ fourth wife, Anne Marie Clarke Thomas, and later run for years by her niece, Margaret “Maggie” TeBeau. Thomas’ daughter, Sarah Alice, attended the school as a girl, became a teacher in her own right and would run the school herself for many years.